My old friend, Budapest-based Scottish painter JIm Urquhart at an exhibition of his swimming pool painting in Brighton this weekend. I’ve just spent a few days at the Brighton Festival. I’m here by a sort of mistake – it’s a long story, but by wild coincidence, a good painter friend of mine from Budapest was also in Brighton this weekend – exhibiting his paintings as part of the event (note to self: I must blog about how threads of wild coincidence knit through my life, yet I can never use them in my fiction as they are just too unbelievable). 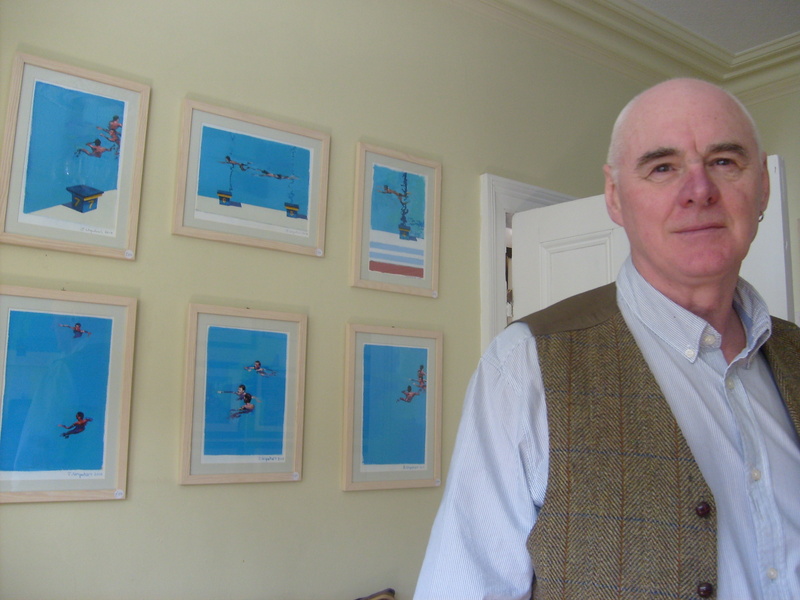 Jim Urquhart is a Scottish painter who has lived in the Hungarian capital for decades. He was actually one of the first people I met in Hungary in 1998 when I moved there first, and has remained a great friend and artistic supporter down the years. So, I was delighted by the serendipity which had us both wash up on the shores of Sussex this weekend. Great show too, Jim! Brighton also allowed me the opportunity to catch up with another friend, the County Antrim poet and current Brighton resident, Brendan Cleary. I get great inspiration and encouragement from artists working in other art forms and meeting up with Jim and Brendan over the weekend, has also delivered all the other positives that time spent with good artists provides: discussion and progression of ideas, affirmation that art is what I am about and what I should do, reassurance that as difficult and isolating it can be to be an artist, it is also hugely rewarding. And, if you are an artist, there is nothing you can really do about it – you have to create. I’m thanking whatever powers conspired to get me here this weekend to hang out with such creative minds. I’m all fired up and reassured. Here’s to artistic fellowship! 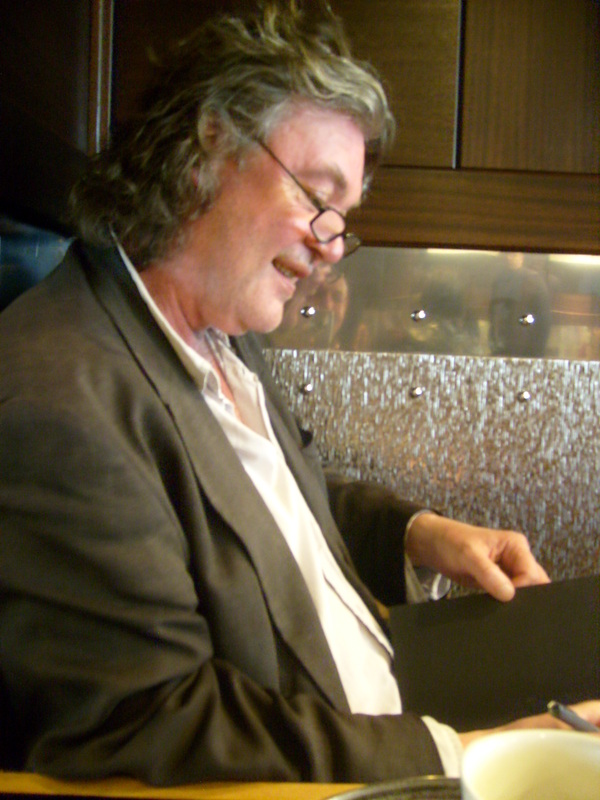 Brighton also allowed me to catch up with another old friend, Brighton-based Co. Antrim poet, Brendan Cleary. This entry was posted on Monday, May 14th, 2012 at 18:04	and posted in Uncategorized, Writing. You can follow any responses to this entry through the RSS 2.0 feed. Yep, it was meant to be! I can never use them in my fiction as they are just too unbelievable – that makes me smile. Your friend’s pool photos are just great. I love the paintings. That blue! Are they watercolor? How great for you to run into him, and them. I really enjoyed that post and would love to hear more about your wild coincidences.